GET A LOAD OF YOUR MIND – SIT ON A JIMMY’S THUNDERBOX… BUT WATCH OUT FOR THOSE REDBACKS! Nature walks, having a dump or pooing in the bush – call it what you will, it’s a necessity and a natural thing that needs to be done while out enjoying a camping holiday. It’s hard to prevent the ol’ legs from getting a bit of shake or tremble while squatting – it’s just not a natural position to be in. So, from my humble experience of having laid my fair share of cable while out camping, it’s best to sit on something… just like the porcelain bowl at home to make the job easier and more relaxing. 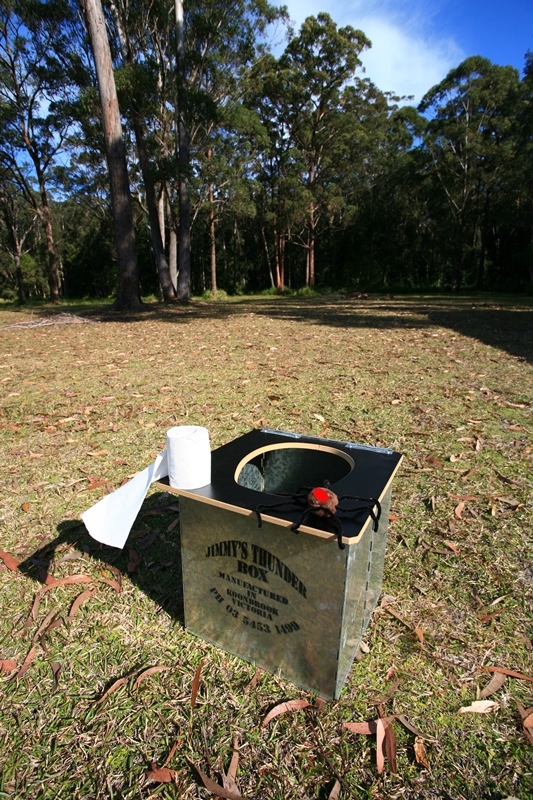 The Jimmy’s Thunderbox is a simple, fold-flat galvanised sheet metal box, complete with timber top and folding lid and comes packed in an old-style Hessian carry bag with heavy gauge wire handles that not only aids in carrying, but help disguise the fact you’re slinking away from camp for a poo. Once you have chosen your private spot to read your favorite 4x4 mag and dug the hole, simply unfold the metal box, flip the timber lid over, drop your strides or lift your skirt and start pushing. Jimmy’s Thunderbox comes complete with one plastic bag that attaches to the inside to catch your deposits. After that, you’ll need to supply your own bags, or dig an appropriately deep hole in an appropriate place, which then needs filling in with dirt to hide the fact that any ablutions have taken place. For the sake of the environment and all other campers, this really needs to be adhered to. There’s nothing worse than seeing, smelling or stepping in someone else’s business or having skid-marked dunny paper blowing in the breeze. A tip; if you've decided to set up an official Thunderbox-spot at your campsite and have chosen the ‘dig-a-hole’ option, I’d suggest lining the box with a plastic bag to prevent ‘splash back’ or ‘dribble’ coming in contact with the metal. It won’t hurt it, it’s just that when the whole show is over, with the Thunderbox packed away in the back of your wagon, on a stinking hot day, let’s just say it can get pretty hard on the nose! Oh, and don’t forget your dunny roll – Eucalyptus leaves sting…or so I’m told!